Go Paperless today and access your Invoices and Account Statement online! Your Invoice contains your Account's unique Registration Code and instructions on how to register. You can also contact a W.B. Mason AR Representative to sign up at 800-242-5892, extension 5712. 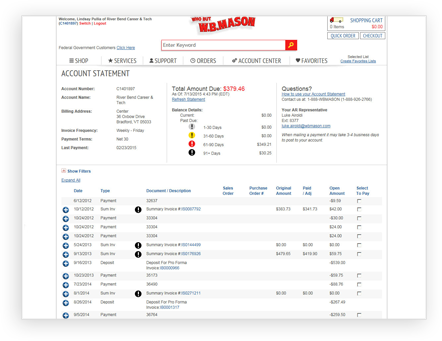 Convenience: Access your statement online and view invoices, credits, and your account balance on your schedule! Stay up to date: Your online Account Statement is an easy way to see the open items on your account and view your current Account Balance. Less Paper: Reduce the amount of mail you have to sort through. And it's environmentally friendly! Receive your invoices faster: E-mail notifications are sent when new invoices are available. 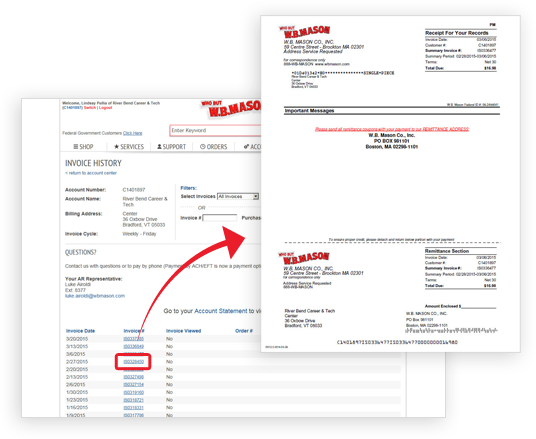 Never lose an invoice again: Search your invoice History by Purchase Order, Sales Order, Date, Amount and more. Please Note: Some customers with custom invoicing may not be eligible for online registration. If your invoice does not contain a registration code please contact your W.B. Mason Accounts Receivable or Sales Representative for more information.